"sound, solid book...a refreshing change from the usual one-size-fits-all health book for women...a strength is the book's up-to-the-minute medical advice." This sound, solid book of health advice for women begins in a rather original way with a chapter on personality types - because how women deal with stress and health depends on their personalities. That's a refreshing change from the usual one-size-fits-all health book for women, and it helps this one stand out from the pack. Another strength is the book's up-to-the-minute medical advice; Carter, a pediatrician, lays out recent medical studies, debunks fads and upsets a few apple carts. There are surprises: some orange sodas and root beers have as much caffeine as espresso (who knew? ), and chocolate may be good for you (thank heavens). 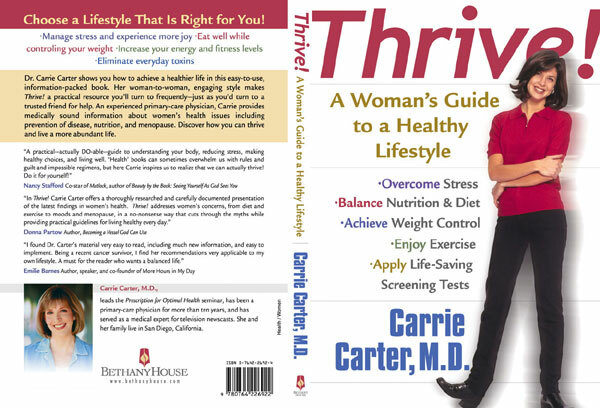 Carter's advise is sensible, particularly as she encourages a balanced eating plan combined with regular exercise or offers sobering information on heart disease. Throughout, the book offers strong Christian content and well-integrated ideas about how faith relates to health. © 2003 Reed Business Information, Inc.
© 2003 by Dr. Carrie Carter, all rights reserved.